Peel the onion and cut in half. Finely dice half the onion and set the other half aside. Place all other ingredients (including the diced onion) in a food processor and mix together. You can also use your hands if you need to – just make sure the mixture is as smooth as possible. Squash the mixture together into a loaf shape and wrap tightly in foil. Slice the remaining onion and layer it at the bottom of the slow cooker, before placing the foil parcel on top. Cook on low for 5½ hours (or around 3 hours on high). Try not to check too early to avoid it drying out. Once removed from the slow cooker, thinly slice the meatloaf into kebab strips. 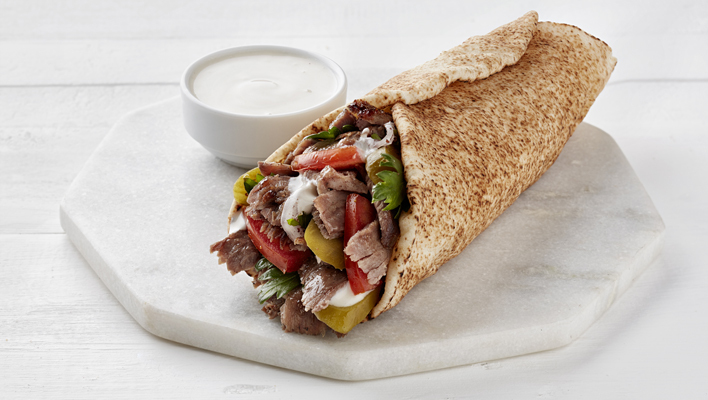 In the centre of each wrap, place tomato slices, pepper, kebab strips, coriander and drizzle with a tablespoon of yogurt. Wrap and enjoy! Soak 8 wooden skewers in water for 15 minutes (this helps to stop them burning). In a bowl, mix together the curry paste and Greek yogurt. Add the chicken cubes to the paste, making sure all pieces are nicely covered. Chill in the fridge. Shake off any excess marinade from the chicken and thread the chicken pieces, onion and peppers onto the skewers. If there is any marinade left, smear it over the kebabs. 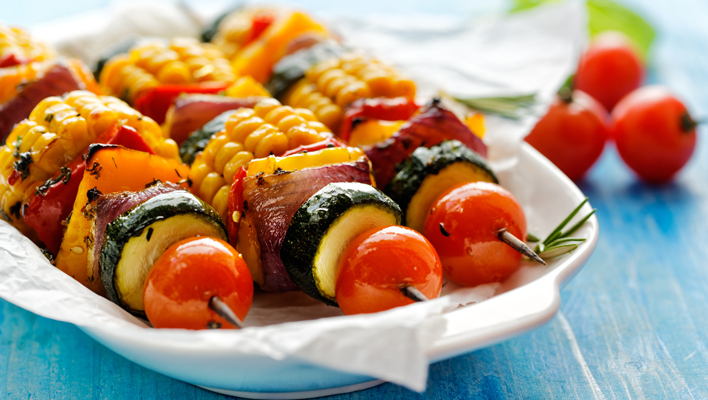 Put the skewers in the fridge to chill while you prepare the rice and fire up the barbecue. Bring a small pan of water to the boil. Add the rice, turmeric and seasoning to the pan and cook the rice according to the pack instructions. Meanwhile, grill the skewers on the barbecue for about 15-20 minutes, turning throughout until cooked and nicely browned. 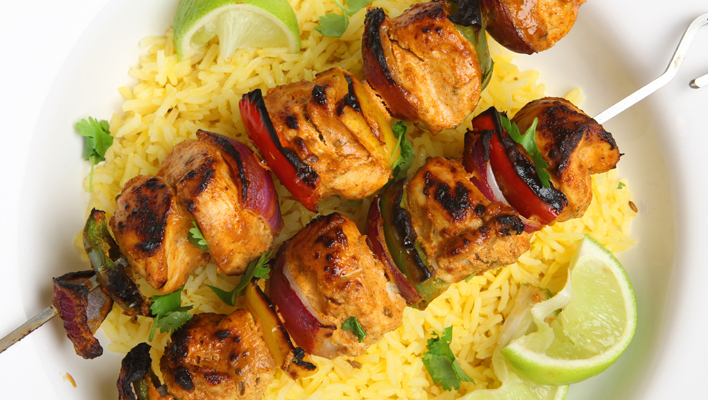 Serve the skewers on a bed of rice, squeeze over a little lime juice. Enjoy! Tip! The kebabs can be cooked under a grill instead of a barbecue. Soak 12 wooden skewers in water for 15 minutes (this helps to stop them burning). Skewer the vegetables onto each one, mixing the order to make them nice and colourful. Spray the vegetables with Frylight and season with the fajita seasoning and chilli flakes. Grill on a barbecue for 15 minutes, turning regularly, until the vegetables are cooked and starting to char. Fire up the barbecue to medium-high. Spray the halloumi and mushrooms with Frylight and season well. Grill on the barbecue for 10-15 minutes until the cheese turns golden and the mushrooms have softened. Toast the pittas and slice open to make pockets. 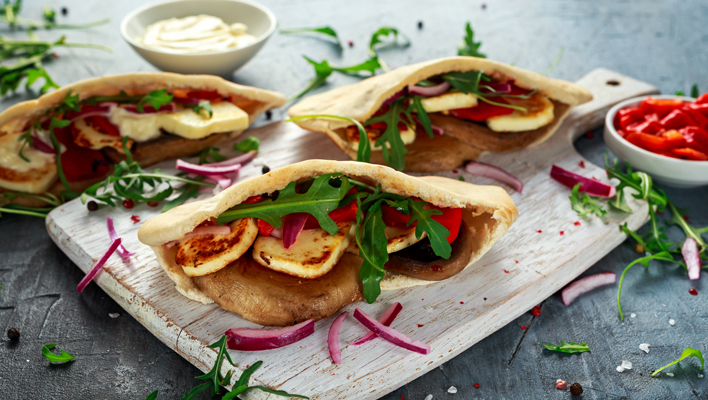 Fill each pitta with a mix of mushrooms, halloumi, red onion, pepper and rocket. Enjoy! Soak 12 small wooden skewers in water for 15 minutes (this helps to stop them burning). 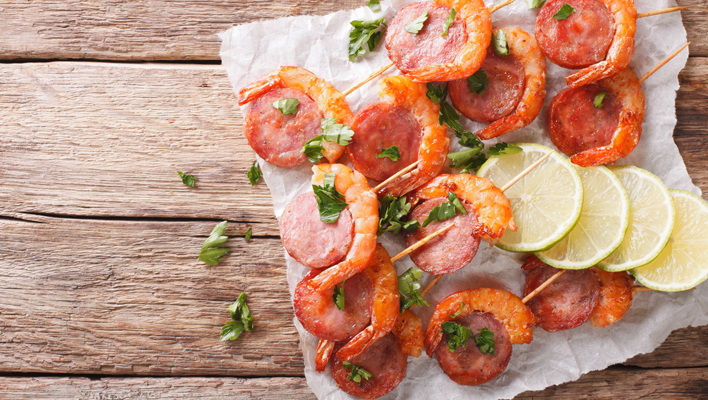 Skewer 2 slices of chorizo and 2 king prawns alternatively onto the skewers. With the chorizo, put the skewer through the length of the slices, rather than through the middle. Spray with Frylight and season with the smoked paprika. Grill on the barbecue for 10-15 minutes until the chorizo is starting to crisp. Squeeze over a little lime juice, garnish with coriander and serve.